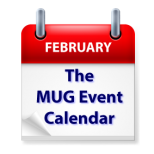 Coming up on this week’s MUG Event Calendar are appearances by Take Control Author Michael E. Cohen at a California group and Les Posen at an Australian group. Dropbox is on the agenda at a Canadian group, and 3D printing is the month’s topic at a Maryland group. Other topics for the week include video effects, CinePlay, Photoshop Creative Cloud and Apple Mail.